GIFT CERTIFICATES are available. Also you can pay by PayPal and Yes we SHIP OUT TOO!!! 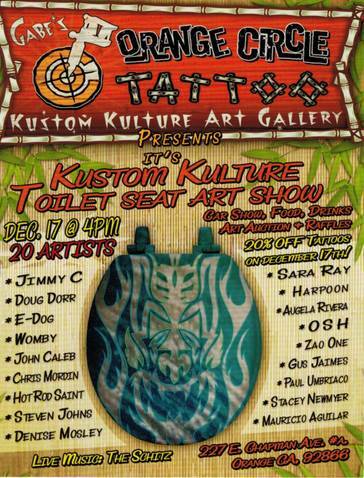 On December 17, 2011 from 4pm to 12am: Gabe’s Orange Circle Tattoo & Kustom Kulture Art Gallery presents their Kustom Kulture Toilet Seat Art Show. 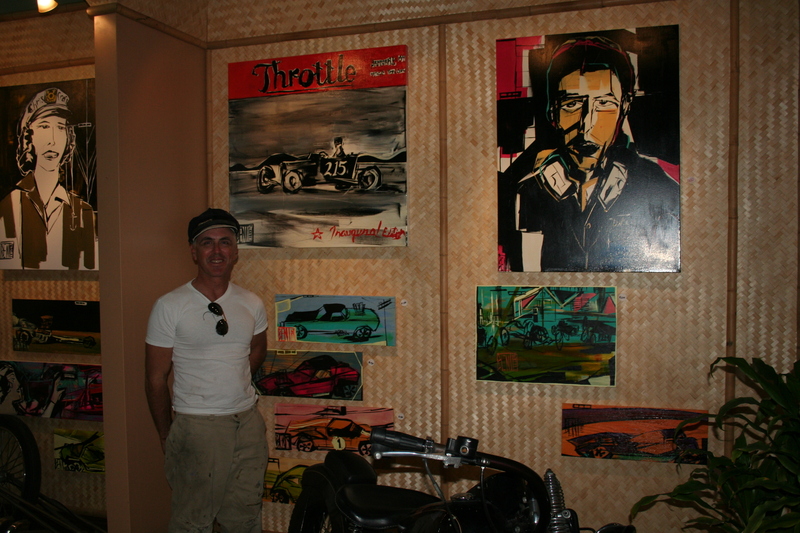 There will be big name artists, a punk band, food, alcohol, car show, art auction and raffle! You can also receive 20% off tattoos that day! 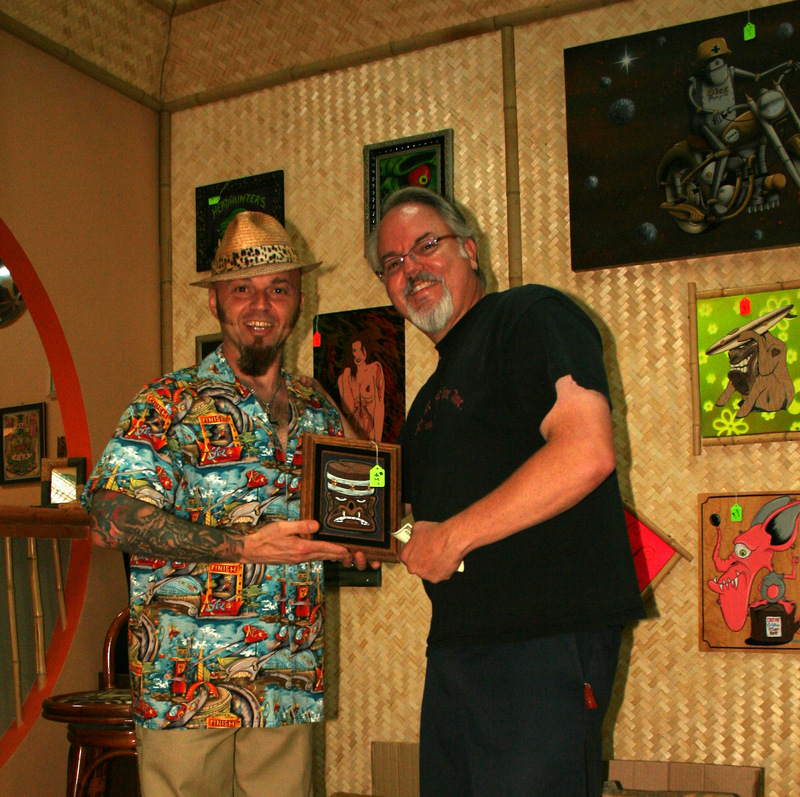 Gabe Csobi (left), the proud owner of the Orange Circle Tattoo & Kustom Kulture Art Gallery located in City of Orange, Southern California, is selling Doug DoRr Kustom Kulture Artist and Pinstriper’s Art Work. My Mickey Sharpz tattoo machine got pinstriped by my old friend of mine, Doug Dorr, the famous hot rod artist, back in the days in 2004…then making me circa 50K over 5 yrs, the machine finally got retired in 2009 and preserved for the future, saving the artwork what was done on it by Doug.The machine has been in a case behind glass displayed at the parlor for the public. Sorry, but NOT FOR SALE.